Hiring the right property manager is incredibly important. This individual has to be trustworthy, responsible, and honest. Otherwise there’s potential for theft and improper management of your properties. This could lead you to spend lots of money down the line to repair damage done to your property that your property manager didn’t take care of, deal with tenants’ needs that you don’t have time for, deal with the consequences of theft, or even go through the process of hiring another property manager. 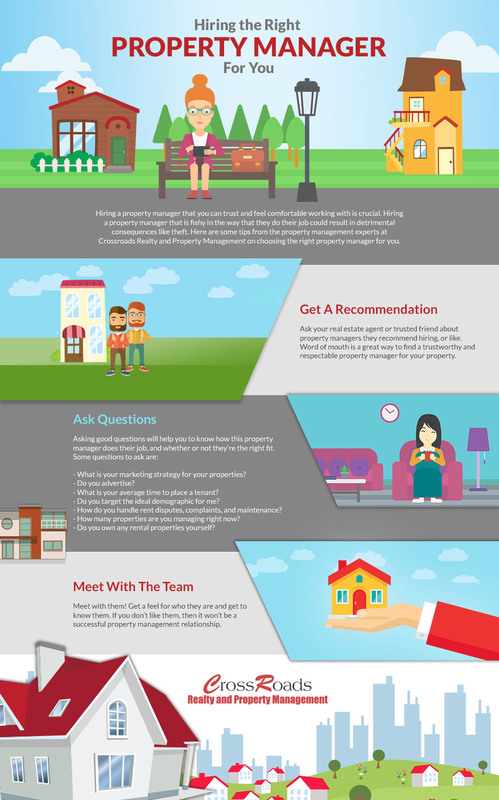 In hiring an initial property manager, it’s important to take the necessary steps to make sure they’re the right fit for you. Word of mouth is a great way to find a trustworthy property manager. If you trust someone, and they trust their property manager, why not seek that individual out? A good rule of thumb is to ask your real estate agent. You have gone through the home buying or selling process with them, and have established trust, so they may know property managers worth hiring. Another option is to ask friends or neighbors. Once you have a list of potential candidates, get in touch with them and interview them. When you do meet your potential property manager, pay attention to the way that they present themselves. Also, pay attention to how you feel about the meeting. If they seem genuine and professional, chances are, they are. Trust your gut. If you get an unsavory feeling about them, don’t go with them. You want to work with a property manager who will be professional, but also approachable, trustworthy, and honest. What is your marketing strategy for your properties? What is your average time to place a tenant? Do you target the ideal demographic for me? How do you handle rent disputes, complaints, and maintenance? How many properties are you managing right now? Do you own any rental properties yourself? Asking the right questions will tell you everything you need to know about your potential property manager. You want someone who will take their job seriously, respond quickly, and prioritize you and your properties. Reviewing the lease agreement is a great way to get quick insight as to how they will do their job. It outlines their expectations for tenants, and the tenant-property manager relationship. If you feel good about the lease agreement, chances are you will be happy with your property manager. Crossroads Realty and Property Management offers an easy online application and quick background screenings for potential tenants. Our property management team takes all the responsibilities of the job seriously. Our professionals are experienced, and hardworking to bring you the highest quality property management services. Contact us today to learn more.